The gear range with 13t rear cog and 54t front chainring – both completely standard – is 19” to 102” (1.54m to 8.11m). That’s a very wide gear range, as wide as a touring or mountain bike, with a low enough bottom gear for almost any hill – and being a sealed hub gear you can select any gear at any time with one twist of the shifter. The conversion involves fitting a complete new rear triangle, which I make in stainless steel. I make this triangle with or without an integral rear carrier as shown in these pictures. Don’t already have a Brompton? No problem, I can build you a complete new one – see the Rohloff Brompton Order Form. Want to see some examples of Rohloff Bromptons I’ve built? 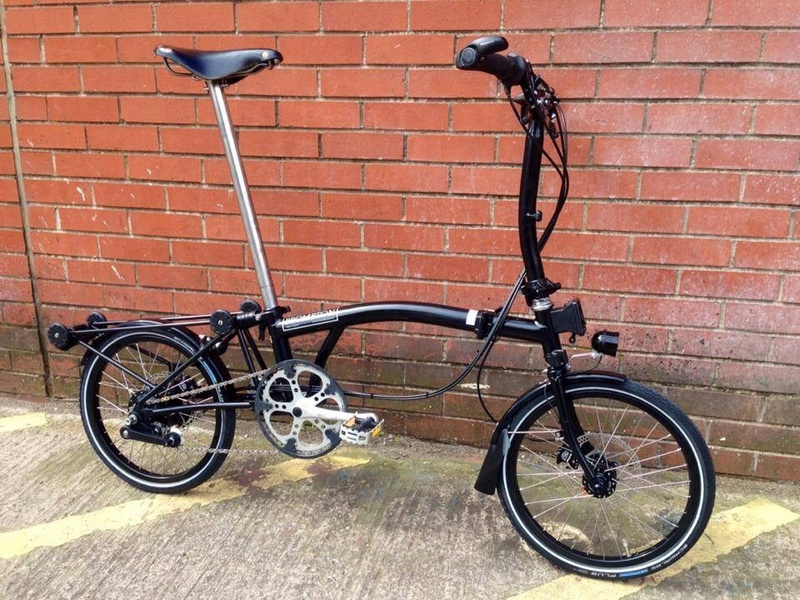 Search the website for Rohloff Brompton. Can this kit fit to any Brompton? Yes – the rear triangle I build will fit any Brompton made in at least the last 15 years. The kit replaces your entire gearing system, so it doesn’t matter what gears you have at the moment. Does the bike fold as normal? Yes, with one exception – because of the wider back hub, the cranks won’t rotate all the way around when the bike is folded. The best trick is to put the cranks horizontally with the left pedal forwards, then fold as normal, this will put the pedals in the best position. Does this make the folded size bigger? Yes, it makes it about 15mm wider – the exact amount varies a bit depending on what handlebars, shifters, brake levers and rear rack and other parts you have. The bike still fits into the original Brompton cardboard box, however. How much weight does this add to the bike? It adds about 800g over the weight of the 3-speed Brompton. Will the Rohloff shifter work with all handlebars? It will fit to all bars, but with the M- and H-type there isn’t much space left, so bar ends won’t work. There’s more space with the S-type and P-type. Is the kit hard to fit? Not especially – the trickiest bit is removing your old rear triangle, the two pivot bolts can be quite solid. I do it with an impact driver, good long 4mm Allen keys usually manage, but occasionally the bolts have to be drilled out which means you need a new rear hinge kit. The rest is pretty simple – fit the new rear triangle, fit the rear wheel, mudguards and rack if you have them, fit the other parts and so the gear cables. Can you fit the kit for me? Sure, no problem – there’s no charge for fitting if I do it here. What’s the rear triangle made out of? It’s entirely stainless steel, brazed together. I use stainless because it’s tough – Brompton rear triangles get a lot of abuse, so a material that’s corrosion resistant is perfect. Why don’t you use titanium? I looked into it – titanium is expensive to work with, and very difficult to repair. It would limit the designs I can make, and it can also have a limited lifespan. It didn’t seem worth it to save a few hundred grams when we’re putting a 1.6kg rear hub on the bike. Does the rear triangle have to be painted? No – being entirely stainless steel, I can leave it as a brushed finish if you prefer. What is the integral rear carrier? Normal Bromptons come in a couple of versions, the L-type with just mudguards or the R-type with an aluminium back rack as well. The kit I make works perfectly with these parts – you can still have just mudguards or the Brompton rear rack. However I also make a version with an integral carrier, made out of the same stainless steel as the rear triangle and permanently brazed on. It is lighter and stronger than the Brompton aluminium carrier. Can it have a belt drive? Yes, this is possible, but with a limitation – there’s only one belt combination that works on the Brompton, 19/70, and that’s quite low geared, giving a bottom gear of about 17″ and a top gear of 88″. What’s in the kit? The kit includes my new rear triangle in stainless steel, the Rohloff hub built into a rim, a chain tensioner, and the Rohloff rear shifter, cables and fittings. Depending on your Brompton, you might need a new chainset and/or chain, I can supply these if needed. I just got back from San Francisco where I was visiting my sister and her new baby. I brought my Rohloff Brompton with me. I can confirm that the hills in SF live up to their legendary status. I thought you might be interested to know that my Rohloff Brompton could handle every hill I confronted in SF. Locals say you can go around the hills but I wanted to see if I could find a hill that I was not able to climb; but I I failed: every hill was climbable. I also rode the Rohloff Brompton on very steep dirt roads outside the city. I was with other people who had 21 geared mountain bicycles who were not able to make it up these steep dirt roads. The Rohloff Brompton you made for me has a 52 tooth chainwheel in the front and a 13 tooth sprocket in the rear. I live in London, which is quite flat, and – before this trip — I could never imagine using first gear. I was wrong. I used first gear often on my trip to California. Overall, I was very impressed with the Brompton Rohloff. Thank you for extending the range of the Brompton bicycle. Hi Ben, any pictures to show the kit in their raw brushed colour? The tensioner is needed because of the way the Brompton folds – the pivot is not concentric with the bottom bracket, so without a tensioner the chain would fall off when folding. Can I order with a black hub? How long will it take the shipping? Do you have stock or do you have to build it? Thanks! 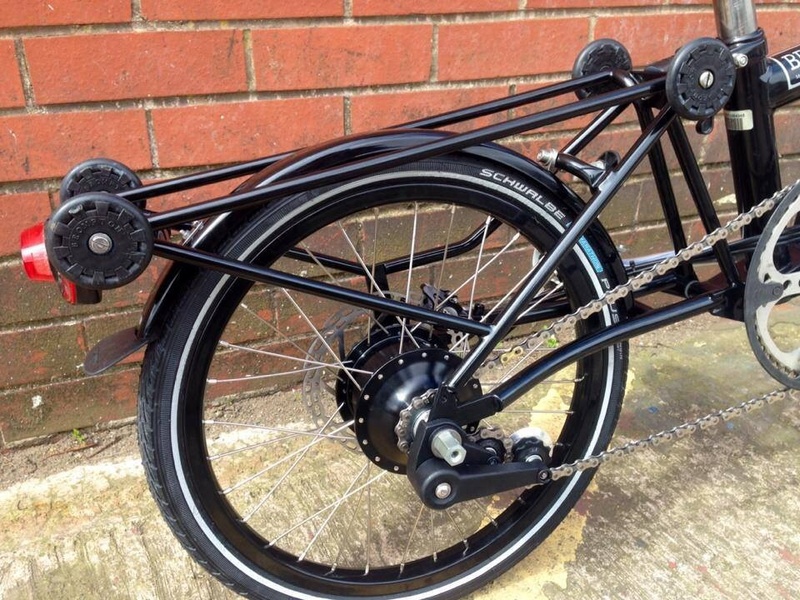 No problem to supply a black hub (or silver or red) – the build time is usually 2-3 weeks. Brompton changed their M and H bar/stem geometry recently, giving more room to fit brake levers, grips, etc. Does this make the combination of Rohloff twist grip and bar ends feasible on the new M-bars/H-bars? There is more space, but still not an awful lot – it’s probably okay if you have smaller hands. I originally ordered my Brompton with a -12% chain ring, will this work with the Rohloff speedhub ? Or do you recommend a different chain ring ? I normally use the 54t (+8%) with the Rohloff – the Rohloff is quite low-geared, so the 44t (-12%) might be a bit small. Hi Ben, I’ve been following your work for years already. Congrats for all amazing Bromptons delivered. I keep coming to your website as I’m intended to buy a Rohloff for my B some day. – Do you deliver to Switzerland? – assuming I’m a good owner and give it good maintenance, how many Km would it last? – Is it compatible with Oval chain ring? Is there any benefit from using it? Hi, no problem to ship to Switzerland, I do quite often. As far as I know, a Rohloff has never worn out! The oil should be changed approximately yearly, and after 5 years or so the oil seals might need a change, that’s an easy job. Apart from that, there’s very little that ever goes wrong with them. It depends how oval – the rear tensioner can take up some movement, but if it’s too oval it might cause problems when folding. Hi, if one goes for the rohloff hub and frame set will the old fork hook to the rear frame normally like with the old rear triangle? Yes, the fork hook still works as normal. Does the stock crank and BB width work with the Rohloff chainline? Yes, as long as it’s a reasonably modern bike, within the last 10 years or so. Any advantage in fitting a Kindernay hub rather than a Rohloff? The Kinderay looks interesting, and I’m very interested in trying one as soon as they’re available. If you need to replace the rim, do you need a special rim for the Rohloff hub? It’s a 32h rim (usually) – they’re available from Sun and Velocity.